The Lifetime Achievement Award (formerly known as the Lifetime Membership Award) is the highest award that NASFAA can bestow on one of its members or an individual who is affiliated with a member organization. To be eligible to receive this award, the individual must first be employed or have been employed by a member institution, be an associate member, or be employed by an associate member organization. This award is the highest that NASFAA can bestow on a member; therefore, the achievements and contributions of the individual must truly be outstanding and significant. Normally, the individual will have made these contributions and achievements over a sustained period of time. This award is not typically made for a one-time achievement or effort, but for work over a sustained period of time for the Association and the profession in important capacities, and contributing significantly to NASFAA's success in meeting its goals. 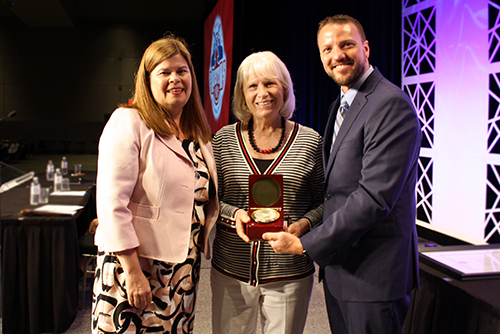 Bonnie Joerschke has spent the last 43 years of her professional life advocating for the ideals of NASFAA and the financial aid profession. Over the span of four decades, she has served on and/or chaired committees for NASFAA, SASFAA, MASFAA, SWASFAA, GASFAA, and OASFAA. She has been a leader in reauthorization and legislative efforts for NASFAA through her work on two NAFSAA HEA Reauthorization Committees, including chairing the committee in 2012-13. Her NASFAA leadership accomplishments also include serving as chair of six other NASFAA Committees: National Conference Committee in 200-01, Leadership Development and Professional Advancement Committee in 2003-04, Research Committee in 2004-05, Federal Issues Committee in 2008-09 and 2009-10, and Consumer Information Task Force Committee in 2013-14. Bonnie has presented a total of 34 times at affiliated national, regional, or state organizations over her distinguished career. Through her advocacy work in NASFAA, Bonnie has truly made a difference in the lives of thousands of students.